Have you ever been pinned down by an angry Russian supervillain at a racetrack and thought, “Man, I really wish I had a portable suit of armor to defend myself,”? Now you can (kind of)! 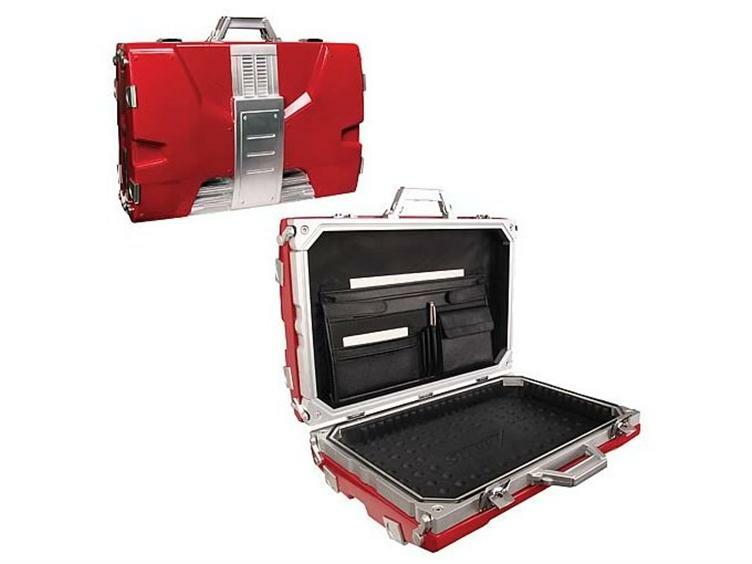 Big Bad Toy Store is selling the briefcase that held Tony Stark’s popular Mark V Iron Man armor. The briefcase that’s on sale doesn’t actually have the armor since that technology doesn’t exist, but the briefcase itself is fully functional so it will still hold pens and important business papers, which is almost as good. At every business meeting, you could bring this bad boy with you, throw it on the conference table, and get all your co-workers wondering, “Oh, does he have the armor or is it just that stupid freaking laptop again?” The answer will always be the stupid laptop, but it’s fun to keep people guessing. The replica costs $459.99 and is limited to 1,000 pieces so pre-order yours today! Hit the jump to check out the official listing and an image of the briefcase. The Mark V Iron Man Suit in its briefcase form. This functional briefcase is made of aluminum and features a genuine-leather interior, custom-molded lazer-cut EVA foam (which reads “STARK”), and a hard-rubber lining seal to protect your files from the elements. The briefcase measures 16-inches tall x 21-inches wide x 6 1/2-inches deep and weighs a sturdy 14 1/2 pounds. The case exterior sports an elaborate machined look, with brushed aluminum and durable red automotive paint, as well as two buckles that have locks for privacy. It’s a limited edition of only 1,000 pieces worldwide!